Recently, I've been turning to natural alternatives in my skincare and I think there's been a noticeable improvement in how my skin looks and feels. Today's post is all about 3 natural body moisturizers I'm currently using, particularly their benefits and drawbacks. Let the battle begin! Key ingredients: cherry oil, organic soya oil, organic olive oil from Italy, Vitamin E. On The Body Shop website, there's also a mention of shea butter, Brazil nut oil and sesame oil, but they're not to be found on the ingredients' list. Naughty TBS! There's some artificial coloring and fragrance added to the product as well. 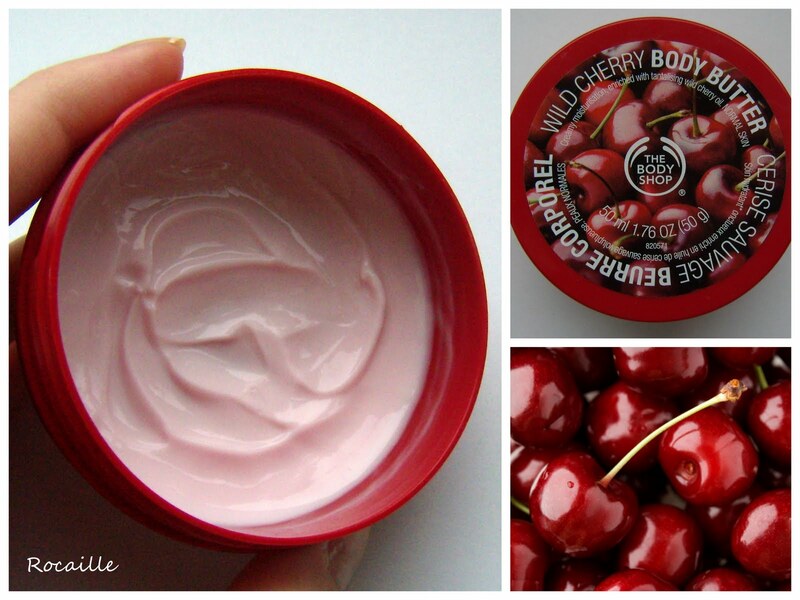 Body butters are one of the classic and most popular products from The Body Shop and they come in 18 different scents. While I'm not very fond of this version, which smells like cherry yoghurt, there are some lovely ones in the collection to choose from. The texture is quite thick and very creamy, it spreads quite easily on the skin and absorbs well, although after bedtime application you can still feel a bit of a slip to your skin in the shower on the following morning. It provides a reasonable level of moisturization. Would I repurchase? No, not really. The product isn't all that natural and I think it's not very cost efficient for what it is. Don't get me wrong, it does a good job at moisturizing my skin, but it doesn't blow me away either, especially considering the price ($20 for 6.8 fl oz.). Key ingredients: oat milk, rose water, olive oil, Fair Trade cocoa butter, rose absolue, camomile, lavender and tea tree oils. Unfortunately, it's not all that perfect, it contains parabens and added fragrance! Ouch! 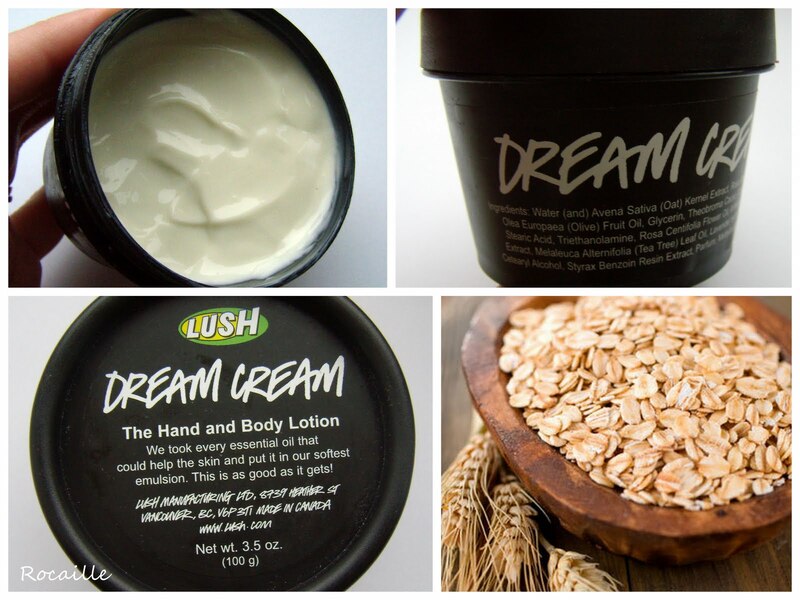 Dream Cream is also a classic Lush product and has a great number of fans. I can completely understand why: it has a fresh herbal scent somehow reminding me of oats, which I love, a medium thick, non-sticky consistency which sinks into the skin right away, leaving it smooth and moisturized. I just love to slap it on dry hands after washing, it makes them feel so comfortable! It claims to have a calming effect and to put this to test I used it on my undereye area a couple of times. This actually worked better than some of the eye creams I've tried, and unlike them, didn't break me out! Key ingredients: Fair Trade cocoa butter, shea butter, mango butter, white chocolate, fresh bananas, honey, peppermint oil, vanilla absolute, sweet orange oil. No parabens this time, but still added fragrance. What can I say, it does smell delicious! Interestingly, I got mine in Canada and it's called Mange Tout (French for 'Eat all') there, while in the US it exists as a Mange Too massage bar. Anyway... Yes, it smells like a mouthwatering dessert. This can be a good thing or a bad thing: my husband loved it, my brother hated it, but most importantly, I love it. 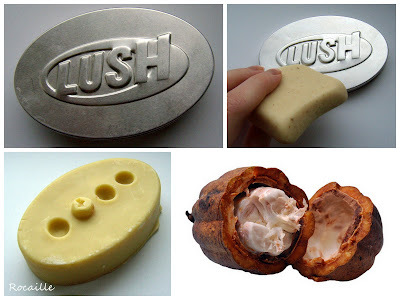 If you're not familiar with Lush massage bars, they're solid bars of moisturizer melting on the contact with your skin, therefore very well suited for a relaxing massage. They're quite oily and take a good while to absorb, which is why I mostly use them before bed. While leaving a bit of residue on the skin, they also give it a lovely sheen, perfect for the summer weather. Would I repurchase? Yes, please! I already have another massage bar waiting to be used, Therapy this time (depicted), and have enjoyed using Soft Coeur in the past. I find them very moisturizing and luxurious, plus the scents are to die for. Not the best option though if you're looking for something non-sticky that sinks right in. I guess it's one of those love/hate products! Reasonably priced at $9.95 for 3.5 oz, you don't need much at all so it's going to last you a good while. I adore Dream Cream and Therapy too. They're probably my favourite Lush products actually. Do you have access to Neals Yard products? They do some amazing body lotions and they're free of all nasty chemicals. @Lillian: Yes, the smell isn't very nice, my mum said it smelled of fruit gone bad :P Maybe it's just clever marketing, but I'm more drawn to natural skincare as of late.